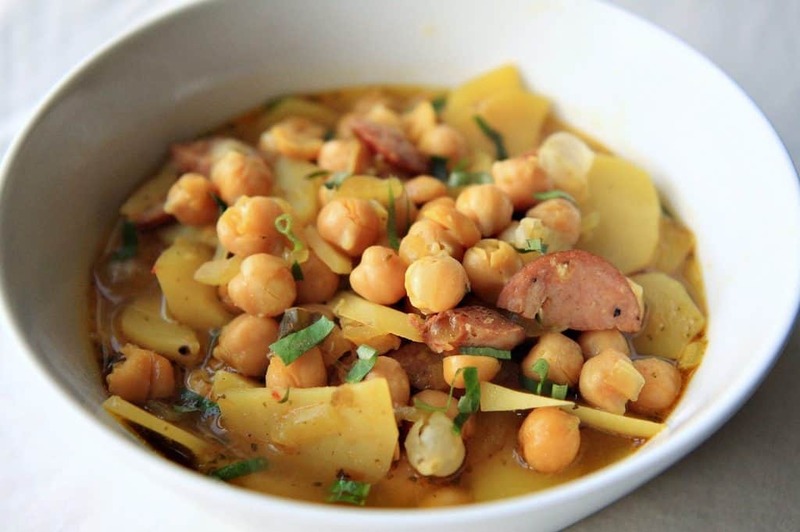 This wonderful Spanish garbanzo bean soup is quick and easy to make and is a perfect comfort food for the cold weather. This recipe will serve 4 people. Wash beans and soak overnight with I tablespoon salt in sufficient water to beans well. Put in pot with ham bone or 3/4 ham hocks, cover, add meat, onion and potatoes. Add paprika, salt, pepper and saffron. Add 2 quarts water. Cook It until beans are nearly soft. Add sausage, sliced thin. Cook until beans are soft. Take out half of the beans; mash and return to pot to thicken. Add correct seasonings. Serve with crusty bread. This serves 4, so I always double the recipe. This Spanish garbanzo bean soup recipe written by Dolly Harris and compliments of a cookbook by the Cuthbert United Methodist Church.